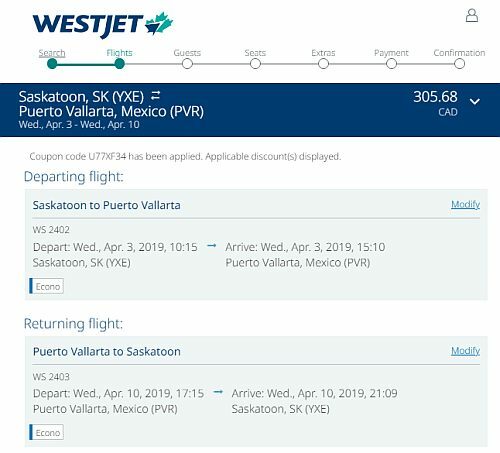 WestJet has dropped the price of a couple of their April flights from Saskatoon to Puerto Vallarta, Mexico down to $359 CAD roundtrip including taxes. The promo code expires on Feb 28 at midnight. More and more travelers are getting fed up with the problems and headaches associated with connecting flights and stopovers. Below you will find a comprehensive list of everywhere you can fly to from Saskatoon on a direct flight, along with the best methods for finding direct flights. There's a last minute flight from Saskatoon to Puerto Vallarta, Mexico for $238 roundtrip after tax. There seems to have been a couple of these lately, absurdly cheap flights to Mexico with no taxes. Air Canada's September 11-18 flight to Puerto Vallarta, Mexico has dropped to $375 roundtrip after tax.